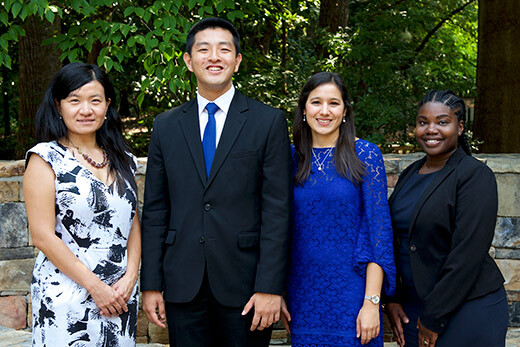 Winners of this year's Emory Alumni Board Scholarships include (left to right) May Pang, Jeffrey You, Regina Zuniga de la Cerda and Elizabeth Odunaiya. For the past decade, the Emory Alumni Board (EAB) has awarded scholarships to Emory students making a positive impact on their community. This year, the $10,000 award recipients are a diverse group and all will graduate this spring. One is an undergraduate who has been involved in almost every aspect of Emory life since he stepped foot on campus as a first-year student. One graduate student is working to implement race-based curricula and is committed to inclusion and diversity work alongside her own studies. Another recipient is back for her second Emory graduate degree and spent the years in between programs as a highly committed alumna in Beijing and Shanghai. And the fourth recipient works toward the goal of ensuring health care is a right for the most vulnerable populations. We asked the four winners to answer five questions about their time at Emory and their future plans. New York native Elizabeth Odunaiya comes from a line of strong women with a background in the medical arts. Her grandmother was a nurse. Her mother was a pharmacist and her older sister is an anesthesiologist. So, it’s only natural that Odunaiya finds herself in health sciences. She’ll graduate this spring from the Rollins School of Public Health with a master's degree in public health in behavioral science and health education and a certificate in human rights. During her time here, Odunaiya has been active in student government, furthering student diversity and inclusion efforts and working to develop race-based curricula at Emory. What I like most about Emory, particularly Rollins, is the acceptance of people from diverse backgrounds and experiences. Diversity and inclusion are two things that Rollins takes pride in. Coming from New York City, I am surrounded by people of different ethnicities, those who are gender non-conforming, people with different abilities, and that is something that I’m truly appreciative of. In the ideal world, where do you see yourself in five years? In 10 years? In an ideal world, I will be the woman that can do it all! I would be invested in a company or organization that is also invested in me. I would be leading the fight to end gender-based violence and creating a new world view of the meaning of feminism. I would be empowering the next generation of black and brown women, providing them with opportunities to be the best versions of themselves. I would also have a family of my own, a loving husband, and have time to travel the world. What do you see as your relationship with Emory after graduation? I hope to be in a position to give back to the community that has invested in me and given me the tools I need to succeed. Volunteering on the alumni board would be the perfect way to ensure that other students are given recognition and the opportunities that they may not receive elsewhere. What is the biggest benefit for you from the EAB Scholarship? The biggest benefit for me is the new network of hardworking and visionary people I will now be connected to. Being at Rollins School of Public Health can sometimes put people in a bubble. I am honored to be able to interface with people from various disciplines and learn the stories behind what drives them to do what they do. What is one word to describe your time at Emory? A Chinese native, May Pang is back for her second Emory graduate degree. A 2009 Goizueta Business School alumna expecting to complete her law degree this spring, Pang spent the years in between her 2009 graduation and her return to Atlanta as an active alumna. She served in various leadership capacities in the Shanghai chapter, then was instrumental in launching and leading the Emory alumni chapter in Beijing. As she built a career in finance, she kept her Emory ties strong, serving as a representative to the Emory International Leadership Conference, hosting former President James Wagner and helping to welcome current President Claire E. Sterk. “When I considered legal study, Emory is the only law school I considered," she says. For business school, it's because I heard that Goizueta Business School has a culture that people are very close to each other and the community is a very friendly one. For law school, it's because I'm a loyal alumna and Emory is always my first choice whenever I want to continue my study. Emory has an open and friendly culture. People I meet here are intelligent, nice and interesting. Alumni are awesome and warm-hearted. I want to do something that can make more impact in the risk solutions financial-tech area. Especially when I see there are many cross border opportunities between the U.S. and China. I used to serve as president of the Emory Alumni Association Beijing Chapter and will continue to involve myself with the Emory Alumni Association no matter where I go. From his very first days on campus, New England native Jeffrey You, who graduates in May with a bachelor's degree in business administration from Goizueta Business School, has immersed himself in Emory life. He’s served in leadership roles in his fraternity, executive roles with the Student Alumni Board (most recently as current co-president), played violin with the symphony orchestra, and most recently was an orientation leader for the incoming first-year class. And if he hasn’t led an organization in some way, he’s helped oversee their activities as student manager of Emory’s Dobbs University Center. First, the class size really appealed to me. Second was the city of Atlanta. I enjoyed all the attractions it had to offer in terms of different types of cultures and Atlanta is home to the third-largest concentration of Fortune 500 companies. Especially studying business, Atlanta would be a great city to be near. Third was the campus environment. Walking down Emory’s campus for the first time, you would never guess its proximity to a major metropolitan city. What do you like most about Emory? I like the people at Emory the most. Everyone here is so friendly and sincerely wants to get to know you and be there for you. It is a very collaborative environment; although many people here are very intelligent, it is wonderful to see the sharing of knowledge in a “we all succeed together” mentality. In the short term, I hope to continue working after graduation. In the long term, I see myself going back to school for some type of graduate study and in the very distant future, using the skills and knowledge I have acquired to positively impact society in a meaningful way. Through my involvement in the Student Alumni Board and interactions with the Emory Alumni Board, it is very clear to me that alumni help keep the spirit of the university alive. During my freshman year, I volunteered at the Class of 1965 reunion. I was stunned by all the 50-year alumni who had come back to Emory and how much interest they had in my undergraduate career and what I was pursuing. This experience helped me realize that students want help from alumni but may be afraid to ask, while alumni want to help students but may not know how. I hope to stay involved with Emory as an alumnus after graduation to continue bridging that gap and strengthening the relationship between students and alumni. A trained and practicing physician in her native Guatemala, Regina Zuniga de la Cerda focused her skills on the reproductive and maternal health of indigenous women in rural settings. This led to her interest in public health, focusing on the right to health care in vulnerable populations. During Zuniga de la Cerda’s time here at Emory, she has been engaged in a study of African American women in the post-partum period, studying health care from the woman’s perspective. She will graduate in the spring with a master's degree in public health. When I came to visit Emory, I fell in love. I loved the green campus, the art displayed in its wall and most importantly the people working and studying at Rollins School of Public Health. In addition, Emory offered more opportunities for international students. And faculty seemed particularly interested in each individual. The diversity of students and faculty. I have learned so much outside of the classroom, discussing topics such as religion, health, politics and cultures from around the globe. There is an infrastructure dedicated for research. You learn from the primary investigators, who have years of experience in different countries and projects. It’s hard to plan for five or 10 years ahead. There is no ideal world and I believe you make the best of the time and opportunities you have at the present moment. I have also experienced that as time passes, you change and so do your priorities. And that exactly explains why I came to Emory for my MPH. I just hope I can keep being true to myself in the pursuit of my own goals and in such a way that I will be able to ameliorate the pain of the ones around me, in one way or another. Emory is a place that will help you become whomever you wish to be. I want to keep engaged in this community and help others experience what I have.